This is the second of two articles featuring historical trivia largely ignored by conventional Philippine history textbooks but immortalized in documents submitted by schools in 1953 in compliance to President Elpidio Quirino’s directive to reconstruct the nation’s history. Not all of Batangas’ towns and cities are represented. Some may not have been digitized by the National Library of the Philippines, the repository of the original manuscripts. It may also be the case that some towns did not submit. The document about Lipa, unfortunately, is incomplete and the remaining pages were all about the town’s traditions rather than anything in the way of historical data. This was also the case for the town of San Jose, the document for which contained only folklore. 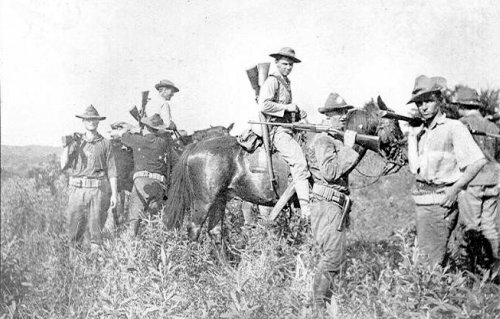 Filipino freedom fighters in Mabini engaged US Army cavalry soldiers in 1899. Image loaded directly from Arnaldo Dumindin's Philippine-American War, 1899-1902. The town of Malvar used to be one of the barrios of the town of Lipa. Supposedly, the barrio used to be the “kuta” or hive of road bandits called “tulisanes.” To avoid suspicion and possible raids by Spanish troops, the barrio was named “Luta” but apparently as derived from “kuta.” When the barrio broke away from Lipa and became an independent municipality in 1919, the new town’s prominent citizens opted to name it Malvar after the Santo Tomas-born general who was the last to surrender to the Americans in the Philippine-American War. The town of Malvar was supposed to have been once a hive of bandits. Image credit: Google Street View. In World War II, Japanese forces built two airfields in the town of Lipa. These were called Lipa West and Lipa East airfields. Lipa West airfield, which would eventually become Fernando Air Base, was a mere kilometer or so from poblacion in Mataasnakahoy. Hence, many houses in the poblacion were commandeered by the Japanese Army for use by pilots of its air corps. In 1945, as American forces neared, the Japanese burned down these houses and massacred civilians before leaving the town. Lipa West airfield was close to Mataasnakahoy, where houses were occupied by Japanese pilots. Image credit: John Tewell on Flickr. The western Batangas town of Nasugbu was among the earliest in Batangas to rise up in arms against Spanish colonial rule in 1896, its young men led by one General Pedro Ruffy. Although initially defeated, the rebels retreated to the barrio of Bunducan and joined up with other rebel forces under the command of General Eleuterio Marasigan. The rebels returned and engaged Spanish colonial forces again, forcing the evacuation of the civilian population. They were again defeated and forced to retreat. Meanwhile, the Spanish forces flew into a rage, rounded up about 500 men, women and children who were unable to evacuate into a church. There they were shot and their bodies burned by the Spaniards. Nasugbu was among the earliest to rise up in arms against Spanish colonial rule; and in retribution, the Spaniards massacred its citizens. Image loaded directly from Texan in the Philippines. Residents of Calumpang, a barrio in San Luis, agitated in 1922 to have the town’s poblacion transferred to their barrio. The case reached the attention of the Department of the Interior through the efforts of the former Senator Ramon Diokno. In the end, Dr. Jose P. Laurel, then Secretary of the Interior, decided that the town’s poblacion should stay where it already was at the time. Poblacion San Luis was almost moved to barrio Calumpang in 1922. Image credit: Google Street View. The town of Taal was capital of the province of Batangas from 1732-1754. At the time, Taal was still much closer to the lake in what is known in the present day as the municipality of San Nicolas. The entire town was buried by the violent and prolonged eruption of Taal Volcano, which began in May 1754 and did not end until December of the same year. Because of this cataclysmic eruption, the town of Taal was moved away from the lake and closer to Balayan Bay while the capital of the province was moved to the town of Batangas. Taal was capital of Batangas but a violent eruption of Taal Volcano buried the town. Image credit: Sandra Plummer Collection at the Fort Worth Library's Digital Archive. In 1950, the town of Tanauan was raided by a strong force of Hukbalahap (Hukbong Bayan Laban sa Hapones), during the last world war a guerilla group made up of communists. The attack, which was done during the anniversary of communism, ended up with the town’s public market being burned down entirely. The Hukbalahap force also surrounded residential establishments. In all, the damage to the town was estimated to have been at least a million pesos, a sizeable amount in the era. Horses and calesas parked near the Tanauan market, c. 1933. Image credit: University of Wisconsin Milwaukee. In 1902, Filipino freedom fighters fought a skirmish with United States Army troops in Taysan. Their bolos and bamboo spikes were no match to American rifles and the Filipinos were quickly defeated. Afterwards, the entire town was fenced in as part of General J. Franklin Bell’s re-concentration policy to end the Philippine-American War. Stocks of animals and rice were taken inside and citizens who refused to enter the concentration camp were hunted down. The Macabebe Scouts, working with the Americans, were noteworthy for their brutality. They took the beautiful girls, stole people’s belongings and burned down houses in Taysan. 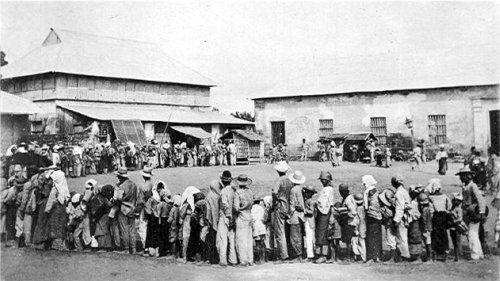 Citizens of Taysan were forced to live in a re-concentration camp like this one in Bauan. Image loaded directly from Arnaldo Dumindin's Philippine-American War, 1899-1902. In 1942, a guerilla group that would become affiliated with the Filipino-American Irregular Troops (FAIT) was organized in Tuy along with other towns in western Batangas. 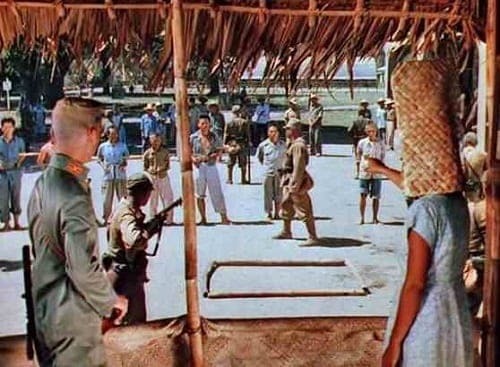 Among its earliest activities was the apprehension of Filipino spies working for the Japanese or the Makapili. One of these was the “notorious” Roberto Ennalen who was caught and shot inside the house of one Bernardino Mendoza on 23 October 1943. In retribution, Japanese forces started inhabitants of Tuy suspected of being part of the guerilla movement. Filipino spies working for the Japanese in World War II were known as "Makapili." Image loaded directly from FilipiKnow.